Everyone wants the best for their child. 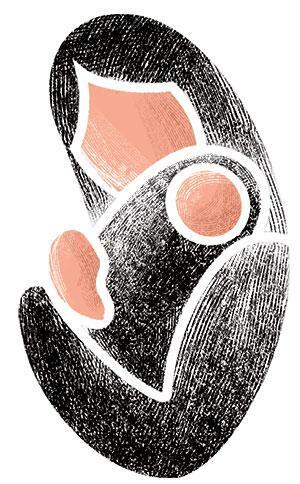 For expectant mothers, this urge begins the moment she finds out that a baby is on the way. They get all kinds of advice from everyone—from their own mothers, relatives and friends—on what they should eat and what they should not. But in today’s times, pregnant women live far from the folds of their families and recommen-dations are not easily available. These suggestions were based on traditional knowledge honed by centuries of experimentation, and modern day doctors do not have the comparable experience. Nutritionists Sonal Chowdhary and Supriya Arun have tried to fill this gap in their book on traditional recipes for pregnant and lactating women. They have given the eating choices from different parts of the country—12 states to be specific—which are very relevant considering that expectant mothers might not be staying in their native places and not having access to the ingredients to make what their family recommends. The book provides 80 recipes along with sample diets to help the uninitiated and useful tips are sprinkled across the pages. The introduction provides an overview of the nutritional requirements during pregnancy. The expectant mother is known to have strange cravings and the book can help meet them in a healthy way. The book also has recipes for common problems that emanate during pregnancy. For example, disturbance in digestion is a common problem during pregnancy and many recipes have ingredients such as cumin seeds that aid the process. Other recipes can boost natural immunity, which is important considering that pregnant women are supposed to avoid medicines such as antibiotics. Apart from the health benefits, the dishes are tasty too. In Uttar Pradesh, from where I come from, eating harira is common after childbirth. For the first three days, a concoction of dry ginger, carom seeds and cumin seeds roasted in ghee (to which jaggery and water) is given to the new mother. This recipe is then modified to include powdered nuts. While the new mother gets to eat most of this dish , other children in the family get a taste of it and this ends up as a celebration. Invariably, it increases the bond between the newborn and other children in the family. 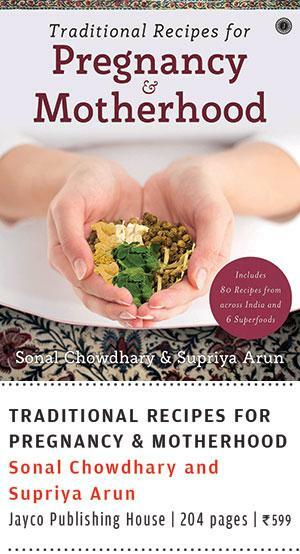 The book also provides non-vegetarian recipes. The authors say that fish is more suitable during pregnancy than meat. Recipes like suraa puttu from Tamil Nadu, which is scrambled white shark fish, are easy to prepare and consume—1 cup each day can increase protein intake by as much as 25 grams. The book gives an overview of six superfoods—moringa, gum, turkey berry, sharavari, garlic and fenugreek that are a must for all mothers. Overall, the recipes can help meet the basic requirements of consuming a rich diet to ensure that sufficient calories are consumed for the development of the baby.